Wang Xu, Summer Wind Before Rain, 2017. Film still. 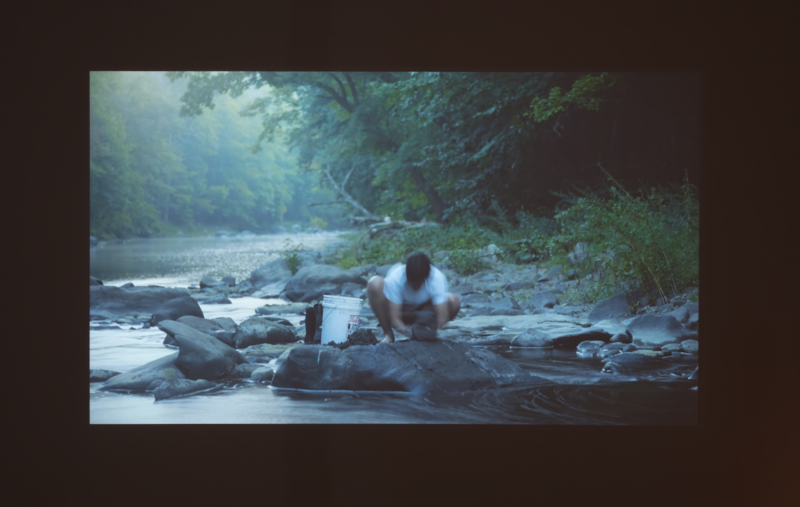 Wang Xu’s video, which he made during a residency last summer at Storm King, where he lived in a hut made of wood and gathered clay from the nearby forest. During his residency, he interacted only with the sculpture park’s gardener. In the eleven-minute video, we see the gardener ride a lawn mower the size of a golf cart, and we observe the artist slowly make a large, realistic bust of the gardener, bit by bit and layer of clay by layer. This video is pastoral, performative, conceptual, and quite unique. The artist Wang Xu works predominantly in sculpture and video installation. For Wang, sculpture occupies an ambiguous space between objects, experience, and social practice, mediated by time and personal memories. Wang’s shows include Mosquitoes, Dusts, and Thieves, 47 Canal, New York; A Frame Apart, Queens International 2016 Short Film Program, Queens Museum, New York (2016); This one is smaller than this one, Postmasters, New York (2016); In Response: Repetition and Difference, Jewish Museum, New York (2015); and Under Foundations, Sculpture Center, Long Island City, New York (2015). Wang holds a BFA from Central Academy of Fine Arts Beijing and an MFA from Columbia University. He is one of three co-founders of PRACTICE.